Research conducted within the National Institutes of Health (NIH) intramural program has been the focus of a PETA campaign over the past several months. Elements of the campaign mirror tactics PETA has used elsewhere to generate media coverage, fundraising, and emails or phone calls to the NIH. The campaign recently reached beyond newspaper, bus, and metro advertisements to include a congressional request to NIH to provide a review of the research. 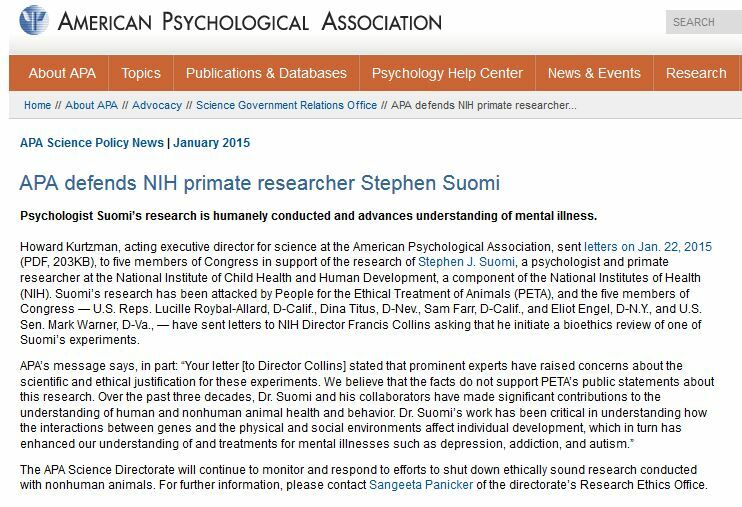 The American Psychological Association (APA) responded on January 22 with strong statement of support for the scientist and research under attack by PETA. “In December 2014 you were one of four members of Congress who sent a letter to Dr. Francis Collins, Director of the National Institutes of Health (NIH), requesting that his office commission a bioethics review of a research program directed by the world renowned researcher, Dr. Stephen J. Suomi. On behalf of the American Psychological Association and its Committee on Animal Research and Ethics, I am writing to provide a broader scientific perspective on this research. As you are likely aware, the request you received was a part of a sustained and well publicized campaign against Dr. Suomi’s laboratory by the organization, People for the Ethical Treatment of Animals (PETA), in support of its mission to put an end to research with nonhuman animals. Your letter stated that prominent experts have raised concerns about the scientific and ethical justification for these experiments. We believe that the facts do not support PETA’s public statements about this research. Over the past three decades, Dr. Suomi and his collaborators have made significant contributions to the understanding of human and nonhuman animal health and behavior. Dr. Suomi’s work has been critical in understanding how the interactions between genes and the physical and social environments affect individual development, which in turn has enhanced our understanding of and treatments for mental illnesses such as depression, addiction, and autism. 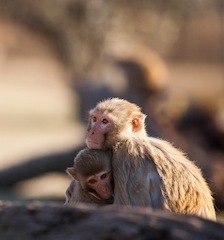 Dr. Suomi and colleagues found that like humans, monkeys share similar variants of genes that make an individual more vulnerable to mood and personality disorders; however, genetics interact with experience in determining such disorders, and mother-infant dynamics in particular have a large influence on later development. Dr. Suomi has successfully produced monkey models of depression and excessive alcohol consumption and his studies provide insight into modes of treatment. Through his work on neonatal imitation, Dr. Suomi discovered potential early signs of atypical social development in monkeys, which has informed the search for screening methods and treatments for autism in human children. Further, through his work on the development of attachment behavior to a caregiver, which is crucial for infant survival in both humans and other animals, Dr. Suomi’s research has had a tremendous impact on the standards for the welfare of nonhuman animals in captivity. The specific study targeted by PETA was designed to investigate the long-term effects of fluoxetine (Prozac) in children. Given that drugs are typically tested only on adults, the effects of this commonly prescribed anti-depressant on children were unknown. Thus, in response to overwhelming concern raised by parents, physicians, and others involved in child and adolescent health about the safety of this medication for children, Dr. Suomi and his colleagues began a study with baby monkeys to elucidate the effects of fluoxetine in children. Contrary to PETA’s repeated claims that animal research has not improved human health and that modern non-animal research methods are more effective, there are, in fact, no viable non-animal alternatives for identifying the causes of and treatments for disorders that affect the brain and behavior. Studies with a wide variety of nonhuman animal species have been and continue to be integral to basic and applied research on health. Laboratory animal models generally provide the most scientifically rigorous means of studying normal and abnormal behaviors in order to better understand their underlying mechanisms and to remedy disorders. Monkeys are the ideal model for the work that Dr. Suomi does, because they share approximately 93% of human DNA, they live in social groups with similar mother-infant dynamics as humans, and they develop more quickly than humans. Moreover, the monkeys in Dr. Suomi’s studies are treated humanely, following strict guidelines set forth by the Animal Welfare Act and overseen by numerous entities including the NIH Office for Laboratory Animal Welfare (OLAW), the United States Department of Agriculture (USDA), the Association for the Assessment and Accreditation of Laboratory Animal Care, International (AAALAC), and institutional animal care and use committees. And given that Dr. Suomi is an intramural researcher at NIH, you can be certain that his research animals receive premier quality of care. I understand that it may sometimes be difficult to weigh the qualifications and varying conclusions of “dueling experts,” but let me assure you that Dr. Suomi is a highly regarded member of the APA and the psychological science community at large, as well as a highly sought-after expert in the field of pediatric medicine. In addition to providing information to the U.S. Congress, Dr. Suomi has testified at the World Health Organization and addressed the British House of Commons about the implications of his scientific findings.